Recently I was lucky enough to spend a full week in Istanbul. Seven days of culture, eating and hard work. But even the most stressful day can be heaven if a Doner Kebab awaits you for lunch, or Köfte, or Shish Kebab. Yes, I discovered my meat-loving side on this trip. Don’t get me wrong, I’ve been eating meat for about a year now (after 8 years of vegetarianism), but never in these proportions! In Turkey, I had meat for lunch and dinner! Thank gawd Turkish breakfast is not like a German one with sausage and cold meat – that would have just transformed me into a sausage. On this trip I also learned to love the graininess of Turkish coffee and found out that wherever you go, you first sit down and have a cup of tea before you do business. Even in the most rushed interview situations, these Turks always find a quiet moment to enjoy their çai. Not a big tea drinker myself, I certainly had had more tea in this one week than in the entire year so far. Like Turkish coffee, Turkish tea is quite an acquired taste: imagine a typical British cuppa, but without the milk and (in our terms) totally overbrewed, so that it tastes quite bitter – a bitterness that is countered by lots of sugar. But it wasn’t all only about food. Overall, Turkish culture won me over and didn’t stop mesmerizing me. From the busy bazaars to the quiet little backstreets, from the breathtaking Blue Mosque and awe-inspiring Hagia Sofia to steamy Hamams and tiny jewellers’ workshops behind the Grand Bazaar – everything was so interesting and I am still digesting all these colourful impressions.But back to my favourite subject: food. In Istanbul food is everywhere! Cross any main square and you’ll see people selling corn on the cob, warm chestnuts or Turkish bagels. On every corner you can order freshly-squeezed pomegranate juice. And the stereotype is true: Doner Kebab is a very common sight. What fascinated me most in Istanbul was the sweet stff. Baklava on every corner, really, everywhere! The same goes for the divine Turkish delight, or lokum. For those of you who have never had the pleasure of eating one of these delightful little sweet cubes, imagine it like a chewy candy made from starch and sugar and infused with flavours like rose, pistachio or lemon. I had the honour to be invited into a Turkish delight factory and was shown how they make that stuff. Really impressive. But over to this post’s recipe, dedicated to my trip to Turkey. It’s a take on the traditional Baklava. Normally Baklava doesn’t have any cinnamon in it, and mostly they just use one type of nuts – walnuts or pistachios. I decided to stir things up a little and make a “European version”, with cinnamon. Unfortunately the pistachios kind of lost their impact when competing with the cinnamon, so I’d suggest using only walnuts if you can’t find any pistachios since it won’t make a huge difference. Also, the orange blossom water and rose water lose their strong taste in combination with the cinnamon, which I actually enjoyed, since it’s more subtle. I made a whole tray of these for Lawrence’s BBQ (which ended up more of a house-party due to the typical British rain!). Not sure if people actually like Baklava, I was most pleasantly surprised when my friends were throwing themselves on them. A couple of people even turned around and paid me the most flattering compliment: that these were the best Baklavas they’ve ever had. Thanks, that made my day, hell, even my week! Put the walnuts and pistachios into a food blender and blend until they’re roughly chopped. Put into a bowl and add the cinnamon and sugar and mix well. Start layering the filo sheets in a square cake tin. Mine is about 30cm by 15cm. Put down a sheet of filo pastry, bush with melted butter and top with another layer of filo that you brush again with butter. Layer about 8 sheets at the bottom, then add half the nut mixture. Layer another 8 buttered filo sheets on top and top off with the rest of the nut mix. Finish off by another 8 buttered filo sheets. Before baking the baklava, cut it into 24 squares. Make sure to cut all the way down through the bottom layer. This enables you to have neat Baklava in the end, since the filo would break if you cut it once it’s baked. Bake for 40 minutes at 180° celsius. Meanwhile make the syrup. Put all the ingredients into a saucepan and let them simmer for about 20-25 mins. Don’t cover the pan, since you want the liquid to reduce to a syrupy liquid. Once the baklava is done, take it out of the oven and let it cool down for 5 mins. Pour half the warm syrup over the baklava (use a ladle so it doesn’t get to messy). Let it rest for a few minutes so the Baklava absorbs the liquid, then add the rest of the syrup. Let it rest for another hour or so until it has cooled down. Before serving re-cut the Baklava at the previously made incisions so you get neat slices (this is because the syrup will have made the nuts stick together, so it needs recutting). 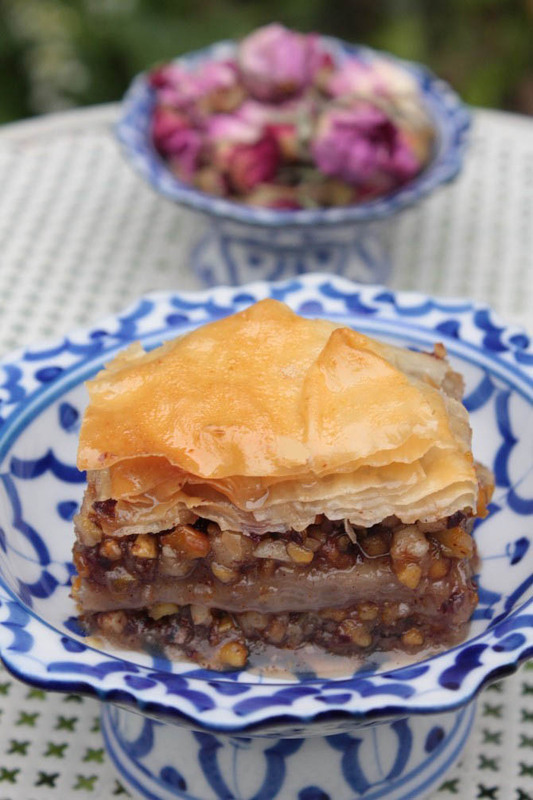 Great post and this baklava looks irresistible! Does it taste as mouthwatering as it looks? I work in a Turkish Kebab Shop in the evenings sometimes and I am a huge fan of Baklava. TheTurkish owner of The Best Turkish Kebab House in Chorley, Lancashire, U.K. (http://bestturkishkebab.blogspot.com/) often goes all the way to London just to get some ‘proper’ Baklava. I am going to try this recipe and see what he makes of it. I also agree with you as to the tea. They stew it and then try to mask the bitterness with sugar. Why don’t they just make it like we do and add less sugar. Oh Paul, now you get me all nervous.. Bear in mind that it’s a take on the classic Baklava, and not the real thing. Let me know what you think of it! By the way, that Kebab House looks delicious, getting hungry over here! this Baklava seems delicious and your pictures are very nice! 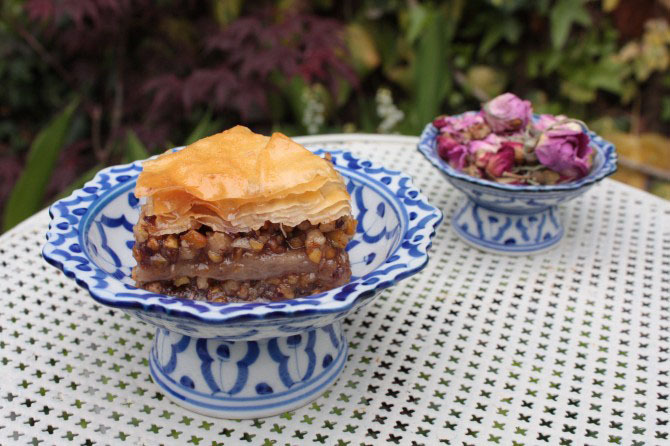 Google brought me to this delightful site, and the content (especially the pictures) made me stay, as I have offered to provide baklava for a friend’s meal on Friday, and can’t find anywhere in Shropshire to buy them. Most of the ingredients are now with me and Amazon brings orange blossom water and rosewater tomorrow. My only concern is the indicated oven temperature. Does filo really rise at just 180deg? Every other baklava recipe suggests 300-320-350? Is the 180 figure correct, or a slip of the finger? I baked my baklava at 180° celsius, and it worked! I’m quite surprised to hear that other sites suggest 300° cesius! That would burn the hell out of any baklava 🙂 So, my conclusion is that the other sites you consulted actually listed the heat in Fahrenheit – and that would make sense since 350°F is about 180°C. I hope that helps. Do let me know how the baklava turned out, and I hope your friends will like it! Have a lovely meal with your friends!